The Four Lads launched their professional career in 1950 singing in local clubs in Toronto, Canada. Quite a few ups and downs later they performed at New York's posh dinner club, Le Ruben Bleu where Mitch Miller from Columbia Records saw their show and asked them to back up Johnny Ray on some of his recordings. This partnership resulted in two major hit records "Cry" and "The Little White Cloud That Cried". After their recordings with Johnny Ray the Lads were signed by Columbia Records receiving their first Gold Record in 1953 for "Instanbul" and from that point their careers blossomed with several hit records and numerous public appearances in clubs, theatres and casinos in North America, Europe and Asia. They were guests on several TV Specials including summer replacement shows and their music was featured in a number of movies. 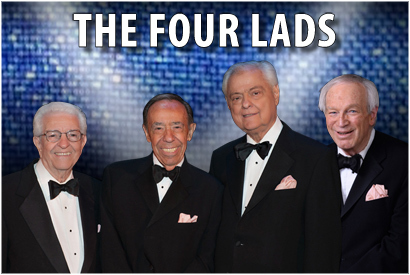 Recently, the Four Lads appeared in two highly successful PBS specials entitled "Magic Moments" and "Moments to Remember". The Four Lads are also known for hit songs such as "Standing on the Corner", "Who Needs You", "No Not Much", "The Mocking Bird", "Down By The Riverside", "Enchanted Island" and of course their most famous hit "Moments to Remember" which remained on the pop charts for over twenty weeks.